Students should be encouraged to think about the time scales involved in the processes affecting sea level change. The visualization shows that the level of the sea at the shoreline is determined by many factors in the global environment, which operate on a great range of time scales - from hours (tidal) to millions of years (ocean basin changes due to tectonics and sedimentation). Comments from expert scientist: The graph brings in one place several causes of sea level change, drawing on connections between various environments: inland, coastal, open ocean, and polar. 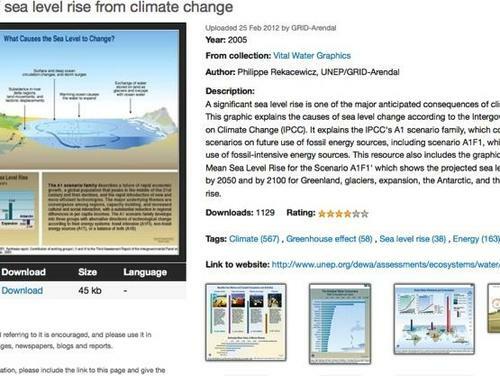 The descriptions are succinct but should convey the idea that sea level change has many aspects to it. The material shows well-know causes of both global and local sea level change. However, there is no clear indication of what is local (e.g., extraction of groundwater or delta subsidence) versus more global (change in circulation or melting of glaciers). The visualization provides a clear summary of the mechanisms influencing sea level rise. It can be used to stimulate discussion.